In the first book of a breathtaking new trilogy by bestselling author Beatriz Williams, two generations of women are brought together inside a Greenwich Village apartment --a flapper hiding an extraordinary past, and a modern-day Manattanite forced to start her life anew. When she discovers her banker husband has been harboring a secret life, Ella Gilbert escapes her SoHo loft for a studio in Greenwich Village. Her charismatic musician neighbor, Hector, warns her to stay out of the basement after midnight, when a symphony of mysterious noise strikes up--laughter, clinking glasses, jazz piano, the occasional bloodcurdling scream--even though the space has been empty for decades. Back in the Roaring Twenties, the basement was home to one of the city's most notorious speakeasies. In 1924, Geneva "Gin" Kelly, a quick-witted flapper from the hills of western Maryland, is a regular at this Village hideaway. Caught up in a raid, Gin lands in the office of Prohibition enforcement agent Oliver Anson, who persuades her to help him catch her stepfather, Duke Kelly, one of the biggest bootleggers in Appalachia. But Gin is nobody's fool. She strikes a risky bargain with the taciturn, straight-arrow Revenue agent, and their alliance rattles Manhattan society to its foundations, exposing secrets that shock even this free-spirited redhead. 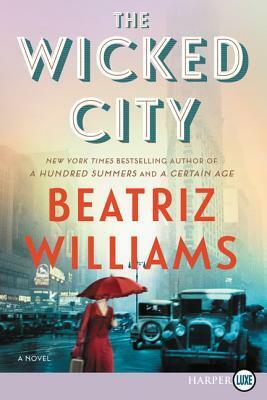 As Ella unravels the strange history of her new building--and the family thread that connects her to Geneva Kelly--she senses the Jazz Age spirit of her exuberant predecessor invading her own shy nature, in ways that will transform her existence in the wicked city. When Ella Gilbert discovers her husband's cheating, she escapes to a studio apartment in Greenwich Vil-lage. Her neighbor warns her to stay out of the basement after midnight, when mysterious noises strike up--laughter, clinking glasses, jazz piano, the occasional bloodcurdling scream--even though it's stood empty for decades. Back in the Roaring Twenties, the place hid a speakeasy. In 1924, Geneva "Gin" Kelly, a quick-witted flapper from the hills of western Maryland, is a regular at this Village hideaway known as the Christopher Club. Caught up in a raid, Gin lands in the office of Prohibition enforcement agent Oliver Anson, who persuades her to help him catch her stepfather Duke Kelly, one of Appalachia's most notorious bootleggers. As Ella unravels the history of the building--and the family thread that connects her to Geneva Kelly--she senses the Jazz Age spirit of her predecessor invading her own shy nature, in ways that will transform her life in the wicked city . . .